Six months into my PhD, and with the encouragement of my DoS (Professor G. De Vita), I applied and was selected to participate in the CARNiVAL international doctoral school, held in Cape Town, South Africa (14-22 November, 2016). Most certainly, the eight days I spent at the doctoral school have been the highlight of my PhD, so far. I had already attended several useful workshops and seminars organised by Coventry University’s Postgraduate Research Support Unit (PGRSU), the Faculty of Business and Law (FBL) and the Centre for Business in Society (CBiS) but this was the first time I attended an inter-university doctoral training programme abroad, which included academics and doctoral students from Coventry University as well as partner institutions. The most remarkable thing about the doctoral school was precisely the way in which it was organised and designed. The aim was to provide a forum where PGRs have the opportunity to network, present their research and receive timely and helpful feedback from peers as well as experienced academics. The school also included specific sessions and workshops by senior faculty aimed at both developing our research and us as researchers. The multi-cultural and interdisciplinary mix of participating academics and doctoral students certainly contributed to making it an enriching experience for all. The PGRs’ presentations and mentoring sessions by staff were intellectually stimulating. For me, it was a fantastic opportunity to get to talk about my research before an interested yet mixed audience; most people in the audience were researching a distinctively different area. This forced me to think about how to present my research to both specialists and non-specialists, thus helping me sharpen my communication skills. It was also refreshing to hear the presentations of other PGRs on a range of different topics, and from other disciplines. The mentoring sessions were also extremely useful. The academics allocated as my mentors, although from different research specialisms, gave me incredibly useful advice, which prompted me to rethink some of my earlier assumptions; I am convinced that my research will benefit from this. In addition, the various research and researcher development workshops on crucial topics such as project management, academic branding, publishing, research impact, working across cultures, were helpful in getting me to reflect on my role as a researcher and on how to develop my professional effectiveness. Of course, the programme was not all about academic presentations and workshops. Many social events such as networking dinners and visits to several South African historic sites made the programme even more remarkable. Apart from providing me with a unique opportunity to network with my South African peers and academics and explore possibilities of working together in the future, it created a perfect bonding experience with my colleagues from CBiS. Back in Coventry, many of us hardly get the chance to spend much time together. However, sharing a close intellectual and social space for a few days helped create a special bond between both the students and the academics that were present. I am now more aware of the research that some of my colleagues are undertaking and of our different skill sets and areas of expertise. Even more vital, I now have additional contacts among academics in CBiS who may provide an additional source of help and advice should these be needed. The context also deserves a special mention. Despite being a Nigerian national, before now, I only had a faint idea of the unique history and the current state of affairs of South Africa. But a little prior reading about my host and the visits to some of the historic sites whilst we were there left a deep impression on me. Among the fascinating sites we visited in Cape Town were the Green Point Stadium, Hout Bay football foundation and Table Mountain (voted one of the seven new wonders of nature in 2011). Yet, for me, it was Robben Island that marked the highlight of the sites we visited. 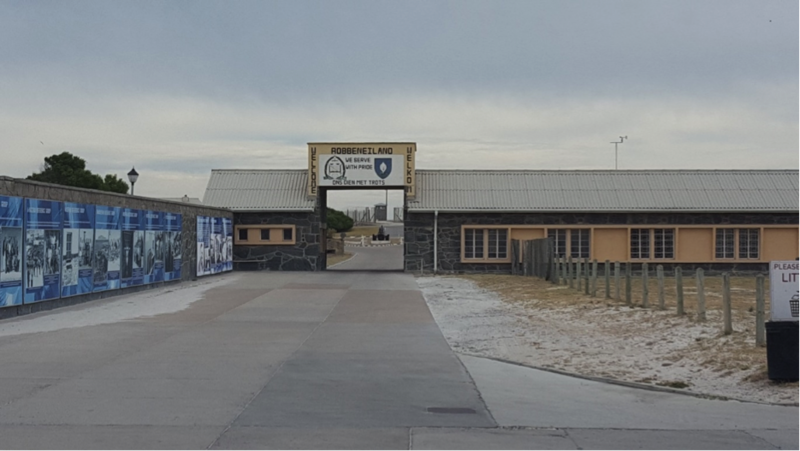 No place embodies the ugly history of apartheid in South Africa more than Robben Island, where the political prisoners of the apartheid government were kept, and where Nelson Mandela spent 18 out of the 27 years he was behind bars. It was very sad to see the poor conditions the prisoners were kept in and the kind of hard labour they were forced to undertake (they dug limestone at a nearby quarry, five days a week). However, despite how depressing it was to hear of such cruel treatment, it also gave me hope. It prompted me to reflect on the paradox of the human mind: having both the potential of descending into the abyss of barbarism as well as the potential to rise above mountainous odds to change an uphill situation and forge a better future regardless of past events. It was even more motivating to learn that Nelson Mandela, at night, after digging limestone in the day time, studied and got an LLB from the University of London through correspondence. I hope I can remember these inspiring lessons when I face difficult times during the course of my PhD. Overall, the doctoral school was a fantastic experience and I am very grateful to FBL, CBiS and CARNiVAL organisers and funders as well as my supervisory team for giving me the opportunity to participate in this wonderful development programme. Get Involved!, Guest Blogs, International, Join Us, plus, Postgrad, Real stories, Student Life, Why Cov Uni?